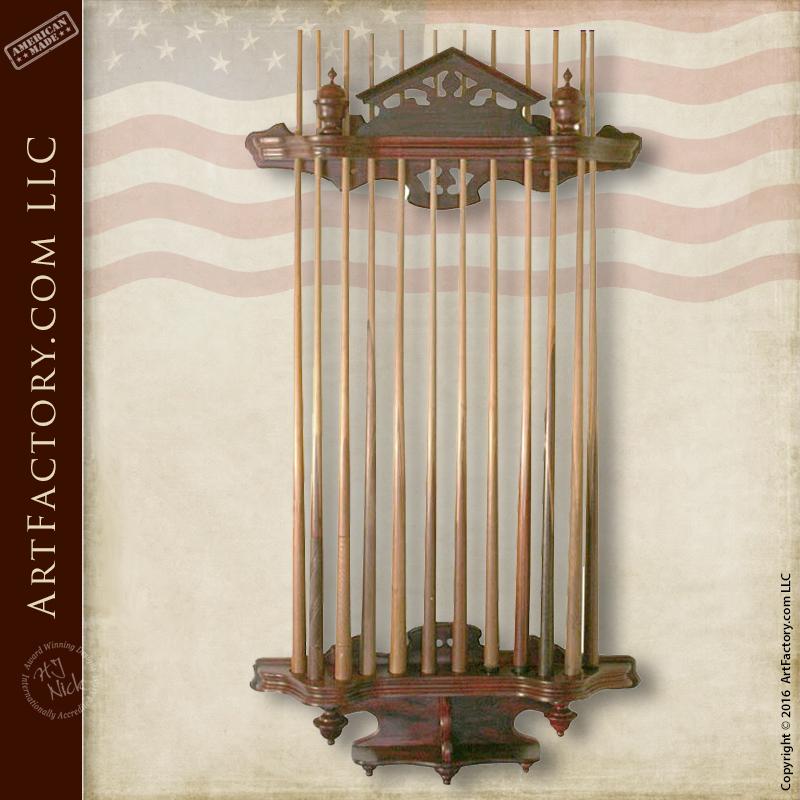 Custom Handmade Cue Rack – Designed From The Historical Record – Hand Carved And Joined – Solid Natural Air Dried Solid Walnut – Original Craft, Not Reproduction Made In The Same Hand And Materials As The Original – Designed From The Historic Record. Master Blacksmithing Solid Hand Forged Wrought Iron – (no castings or hollow faux metals) by the hand of a genuine master craftsman using age old tried and tested techniques. Designs By H. J. Nick and Art Factory. Com LLC a handmade in America custom furniture manufacturer based in Scottsdale Arizona has been designing and building some of the worlds finest furniture for some of the world’s finest interior designers with ordinary clients as well as most prominent and successful Persons,C.E.O.’s,leaders,royalty and celebrities for the last 99 years. Most of our clients want a furnishing that has a BIG WOW factor and elegance. All want investment value and furnishings that makes a proper statement reflecting their personality or the ambiance of the environment for which it is intended. Please Don’t Be Fooled By Our Upscale Appearance. “We Are The Factory,” Hand Crafted In America Since 1913. The earliest known billiard table, in the royal court of Louis XI of France (1461-1483), was simply lawn brought indoors and placed on a large, everyday table. Rail-bounded, cloth-covered tables specifically for billiards, with wooden beds rail cushions (made of layered felt, or stuffed with straw, soon evolved as the game’s popularity spread among French and later other European aristocrats. The increasing demand for tables and other equipment in Europe was initially met by furniture makers of the era, some of whom began to specialize in billiard tables. By 1840, the table beds were made of slate, as they are to this day in quality tables. English table maker John Thurston was instrumental in this change, having tested the surface since 1826. After experimenting with hair, shredded fabric and feathers as stuffing for the cushions, he also introduced rubber cushions in 1835. This was not initially a success, as the elasticity would vary with ambient temperature. After attempting to market cushion warmers with only partial success, Thurston was saved by the 1843 discovery of vulcanization by English engineer Thomas Hancock. Thurston used vulcanized rubber in his later cushions, and it is still used today by many manufacturers (some use synthetic materials). Thurston’s first set was presented to Queen Victoria. In the United States, manufacture of billiard tables has been ongoing since at least the mid-19th century. The forerunner of the Brunswick Company began commercial manufacture in 1845. In San Francisco, California, several manufacturers were active by the late 1800s.